Dimensions 0.25 by 5 by 9 in. Amazon.com description: Product Description: For several years the High Priest of the Temple of Set, unveils some of his own personal inner teachings originally shared with Initiates of the Temple. From the contents of this book all persons who are serious about their own initiatory self-transformation will learn things of deep value which can be put into practice for purposes of self development, regardless of the path they are on. 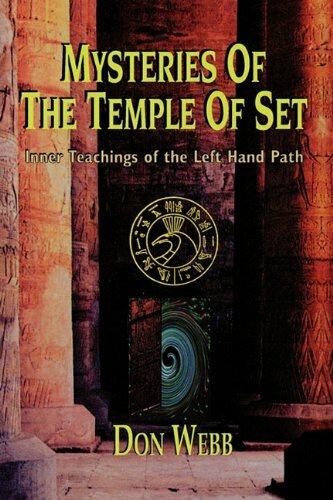 The Temple of Set is the leading philosophical branch of the Left-Hand Path Initiation openly operating in the world today. This book makes some of the inner teachings of the Temple available to the general public for the first time. Don Webb was for some years, before his retirement, the High Priest of the Temple of Set.